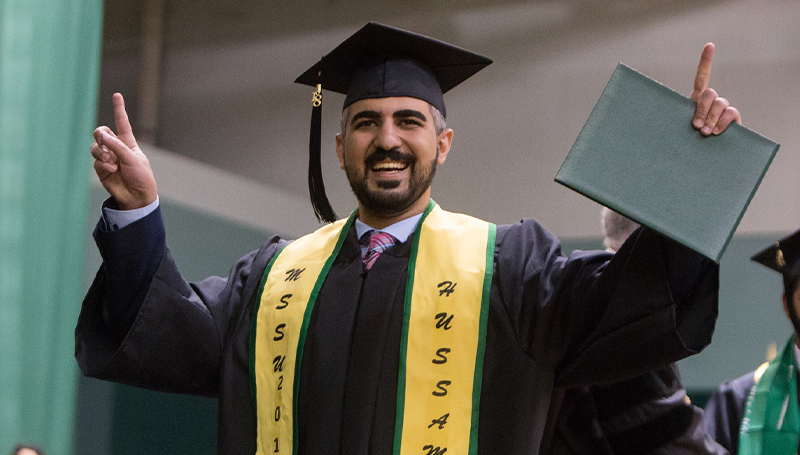 Nearly 400 students will be awarded degrees during the winter commencement ceremony at 10 a.m. Saturday, Dec. 15, in the Leggett & Platt Athletic Center. The university’s 71st graduating class includes 383 undergraduate students who will receive 480 degrees, and 14 students receiving master’s degrees. The graduating class also includes 15 international students from eight countries. Dr. David Pyle, principal of Carl Junction High School, will serve as the keynote speaker. Pyle earned his bachelor of science degree in education from Missouri Southern in 1997, and also holds master of science and specialist degrees in educational leadership. Recently, he successfully defended his doctoral dissertation at Southwest Baptist University. The ceremonies will be streamed live at www.mssu.edu. KGCS-TV will provide live coverage of the ceremony, which will also be rebroadcast at 8 p.m. Sunday, Dec. 16. The station is available on local cable systems, including Cable One, Mediacom and Suddenlink. DVD copies will be available for purchase. For more information, contact Judy Stiles at 417-625-9777.